If you’re tired of grey, feeling tense, lacking creativity and motivation or looking for spiritual direction, you might find yourself drawn to the colour purple. Purple is linked to spirituality as well as inspiration, tolerance and mental balance. Being a creative colour it is often preferred by artists, performers and designers – many of whom like to be surrounded by purple when working. Deep purples are linked to luxury and sophistication, purple paints that have a blue undertone create a cooler, calmer and more contemplative space, those with a red undertone, create a warmer and more vibrant space. Promoting creativity and innovation, purple is an ideal colour for a social or work space. Image Source: plascon.co.za Plascon’s Vancouver dusk provides an anchor to the lighter bands of grey and white above it. As witnessed in nature, one of the best partners for purple is green. If you check your colour wheel, you will see the opposite colour (called the complementary colour) to purple is yellow, yellow will enhance purple and vice versa. Add yellow when you want to lift a purple scheme, if you feel it is looking too sombre. Again, nature provides lots of inspiration, one of my favourite examples is the purple iris flower. Red and purple lie next to each other on the colour wheel and work well together to create an adjacent harmony. Here Vancouver Dusk and Just Terracotta create a warm and creative space with a touch of luxury. If you prefer light walls then pops of deep purple can be added in accessories or artwork. I couldn’t resist including the image below. I love the colour combinations in the artwork of this renovated Manhattan apartment, designed by The New Design Project. Deep purple will create a wonderful ambience in a dining area. The intensity of purple is toned down with white in the adjacent room. Benjamin Moore’s Colour of the year, Shadow, provides the perfect backdrop for this beautiful staircase. Tone on tone, purple creates a dramatic and luxurious look in this living room. The walls, trim and mantel are all painted the same deep purple colour. The furniture and accessories are in similar deep tones. The addition of white artworks add light and the metallics add warmth and interest. Purple gives an air of luxury and sophistication to a room and is ideal for bedrooms and bathrooms. As the colour of twilight it invites us to slow down, meditate and dream. This look is made even more luxurious with the rich fabrics, metallics, glass and contemporary accessories. Textured Japanese Wall Finishes by Satori. A contemporary Eastern plaster made with a sand base. How fabulous and creative is this exterior wall. Sometimes taking a risk and trying something different really pays off. A “purple patch’ means a run of success or good luck, and that is my wish for everyone this week. 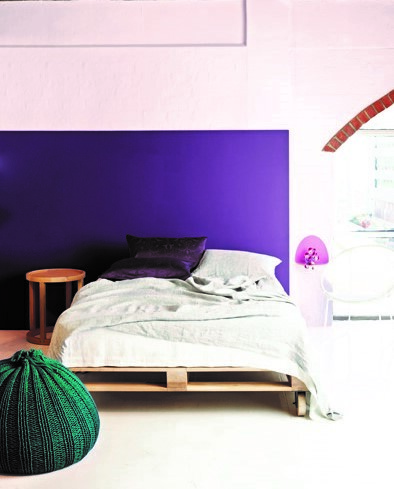 Let me know if you have been brave enough to paint a deep purple colour in your home. If by any chance, you have painted your kitchen a deep purple, I would love to know how you got the go-ahead from your family – asking for a friend!